The biggest abundance in my life, bar none, is my clients. I’ve saved the best for last, for Day Thirty One of 31 Days of Abundance. I have drawn to me a gorgeousness which passeth all understanding. I am one lucky, lucky business coach and mentor. My Club 100 members, twenty five of whom are coming to lunch at our annual Summer Party on Saturday 9th August, include Richard, Natasha, Susie, Julia, Wendy, Lotte, Sam, Cristina, Sally, Veronica, Andrea, Sue, Alison, Karen and another Natasha, another Allison and another Sue, Jo and another Karen, Penelope, Riana, Jennifer and two more Sallys, Angela, Jutta, Debbie, Nicola, Anita, Heena and Deborah and we are anticipating the re-joining of another Julia, plus two new members in Carey and Alice, fingers crossed. I think about forty fabulous women (and Richard) is my goal. So wonderful are the ladies of the Club 100 that I have asked them to write about themselves and, starting tomorrow, I am hoping to feature one of them each day throughout August on my blog, like a sort of Club 100 Calendar Girls with clothes although I don’t rule out them being just as interesting, racy and funny. Do make sure you add me to your RSS feed or Feedly or keep an eye out on Twitter or Facebook for the duration of August 2014 as I feature the lovely ladies of the Club, each in turn. Think Club 100 might be right for you? Now’s the time to join the gang while the price is £100. It goes up to new members only from 1st September to £150 pcm. And no less gorgeous and just as infinite in potential are the smashing and super-dooper clients in Small Business Big Magic. These little wonders include Rachael, Hazel, Megan, Linda, Vania, Morwhenna, Margaret, Jaimie, Irena, Petra, Mina, two Charlottes, a Kevin and a Claire. SBBM can grow much larger too and at the moment we have plenty of room for those on the first rung of the ladder of business ownership. I have big plans for SBBM since we do everything in a group which means I can serve many more and I will be adding value over the next few months even above that they already enjoy. As you will have seen from July, abundance is my joy. And then there are the Abundance clients – those who book themselves in ad hoc, when they can afford it or when they want a little boost. This is a lovely way to have access to something you think you might not be able to afford. These lovelies include Tim, David, Sam, Gemma, Liz, Karen and many more besides. People show up in this category in my diary most weeks and you are very welcome indeed, Voyagers. And then there are the Indys, people who cannot be sandwiched or squeezed into a group because they are Starry or highly individual or protective of their privacy or busy or VIPs or square pegs who don’t fit and revel in that. You know who you are and you are also abundantly appreciated. And joy of joys, this summer’s AbundanceFest crew who, so far, include adventurers Jan, Lisa, Jenny, Wendy, Issy, Lauren, Natasha, Liz, Heena, Beverley and another Liz. You can’t have too many fabulous women, it seems, and more are welcome. We have room for 24 adventurers on the AbundanceFest and I do hope you will contact me and add your name to the list. The cost of a ticket is only £197 and it includes, as you will see, a value of at least £444 and who knows how much more abundance to follow, to infinity and beyond. I do hope one of the remaining tickets has your name on it and that I may add you to my abundance of clients. When you come or whether you come is in your own hands. 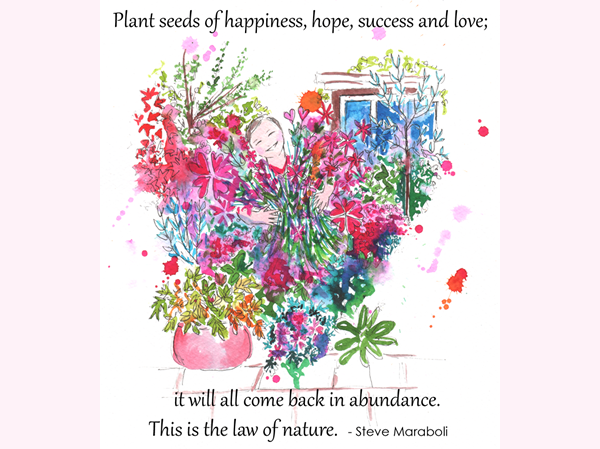 In the meantime, I send you seeds of happiness, hope, success and love. May an abundant life be yours!